The city of New Orleans released a draft report of its disparity study on Feb. 28. The study details hits and misses of the city’s disadvantaged business enterprise (DBE) program while offering recommendations on strengthening the program to create and sustain economic equity throughout the city for all its residents. 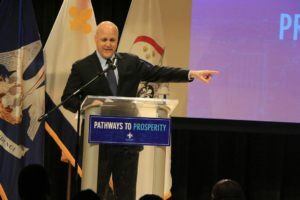 The release of the report and a statement from Mayor Mitch Landrieu was followed by a conversation on economic equity. The event was held at the New Orleans Jazz Market, 1436 Oretha Castle Haley Blvd. “The disparities study confirmed many of the things we already knew to be true, but we needed proof,” said Mayor Landrieu, while also highlighting some improvements to the city’s DBE program during his tenure. The Collaborative, a group of small business owners and community leaders that promote economic parity and equity, has advocated strongly for this disparity study. Barbara Major, a founding member of the Collaborative took time to talk with The New Orleans Tribune about the study’s importance. Major said the report’s findings are key to substantiating the need for stronger programs to increase economic parity, particularly for Black New Orleanians, but she adds that the community will have to work hard and battle for equity. While the draft report finds no overall disparity in the availability and use of women and minority owned businesses for city contracts, the report did find disparities in other areas, including the city’s use of Black-owned firms for construction projects, the overall use of Asian-American and Hispanic-American owned firms and a lack of DBE goals and use of women and minority owned firms for contracts to purchase goods. The disparity study results will help the city determine if its existing Disadvantaged Business Enterprise (DBE) Program is effective and what can be done to enhance it. Recommendations include creating limited competition programs for small procurements in which only DBEs can compete, creating access to capital and bonding programs, increased oitreach to Latino and Asian American contractors as well as providing expeditious and even advanced payments to DBE firms. The study also notes that the city’s DBE program alone is not enough to increase economic parity. In the area of commercial development projects created by the private sector, the use of firms owned by people of color and women was 7 percent and only one percent general contractor dollars spent in the open market went to African-American owned businesses. Private business has to get on board in order to achieve economic equity, Landrieu says. “Without full buy-in and partnership with the private business community, we will not be able to yield full economic growth and development,” he says. The study began in January 2017 and is on track with the release of the draft. There is still time for the public to have more input on the study, which is being conducted by Denver-based Keen Independent Research. According to Annette Keen, who provided Wednesday’s overview of the draft report, there are two additional public meetings that will be held in March (those dates had not been announced before The Tribune went to press) as well as other opportunities for public comment online at www.noladisparitystudy.com, by e-mail to NOLADisparity@keenindependent.com or by direct mail to Keen’s office in Denver at Keen Independent Research, 100 Fillmore Street, 5th Floor, Denver, CO 80206. After obtaining public comments, the study team will complete a final report by May 2018.